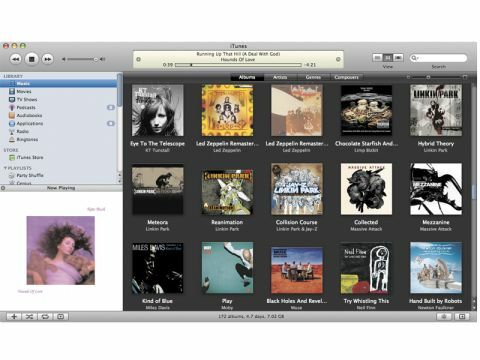 iTunes 8 is new, available and free, so is there any reason you shouldn't install it right now? Nothing major has changed, but the upgrade to version 8 is free and the Genius feature is, well, genius! We've reviewed iTunes countless times before, but Apple has updated it to version 8 to complement the new über-thin iPod touch and the colourful new iPod nanos, so we thought we'd put it through its paces once again. In short, there have been some minor changes, such as the new Grid view and Visualizer, but the big new feature is the introduction of a Genius Sidebar and Genius Playlists, so let's start there. The Genius Sidebar is already open by default when you launch iTunes 8, but needs to be activated before it can function. During activation you send details of your music library to Apple, but your confidentially is assured. The Genius Sidebar takes up about a sixth of the iTunes window and shows links to tracks for sale on the iTunes Store that you don't already own, and that Apple thinks you may like, based on the track you're currently listening to. All the tracks recommended can be previewed and bought directly from the Genius Sidebar meaning you don't have to load up the bloated iTunes Store, which is a relief, but we still found having to wait for all the links to load slightly effected the smooth running of the program. While this 'Amazon Recommends'-style hard sell might sound alarming to some, it's easy to turn the Genius Sidebar off should you find it too annoying, or the recommendations simply too tempting. it has a second string to its bow – you can also set Genius to use its recommendation technology to create playlists out of the songs you already have in your iTunes library. Simply play a song, click the Genius button and iTunes will create a playlist out of songs that it thinks would go well with your chosen song. It's a great way to rediscover songs you'd forgotten you own. To help make its selections, Apple is relying on the vast army of iTunes users whose data it has already sampled. If you like the Genius playlist it suggests then you can save it, or click Refresh for a different selection. While Playlist recommendation software isn't an original idea, and there are many plug-in programs for iTunes that do essentially the same job, having it integrated within iTunes itself means it's a more natural fit, and won't keep breaking every time Apple updates its software. However, because Genius works by knowing what songs go well together based on other people's tastes, you'll find that it simply doesn't work on the more obscure music tracks in your collection. In theory, the situation should improve as more user data is uploaded to Apple, but we certainly found many tracks in our music collection that Genius couldn't deal with. iTunes's 3D Cover Flow was always more of an eye-candy feature than anything genuinely useful, but the new Grid View in iTunes 8 is both beautiful and practical. It's visually very similar to the way events are shown in iPhoto '08. The only drawback is it shows up just how many of your albums have missing artwork, and you're going to have to spend ages tracking it all down if you want your music library to look nice. The final new feature worth a mention is that HD movies are now available through the iTunes Store, whereas previously you had to own an Apple TV to order and download them. The only other changes we could find were that under the hood, Apple has silently removed the ability to hide the iTunes Store arrows in the track lists, as well as the Genre column in Browser mode: this was previously possible through Preferences, but not any more. Is iTunes 8 worth upgrading to? We think so. Installation was simple and we upgraded a number of Macs in the office without having a single problem. Genius is such a great feature you'll wonder how you lived without it, and it will genuinely help you rediscover parts of your music collection you'd effectively 'lost' for years. We even liked the Genius Sidebar recommendations that pop up all the time; let's just hope that Apple can get them to load in a bit quicker in a subsequent update.